DALLAS, TX--(Marketwired - Feb 4, 2016) - Parks Associates today announced new consumer research from 360 View: Energy Management, Smart Home, and Utility Programs, a survey of 10,000 U.S. broadband households, revealing that 36% of consumers would participate in an energy program offering a free product, tied for the most popular incentive alongside payment for non-use of electricity during peak times. Analysts will discuss this new research with more than 350 industry leaders at the seventh-annual Smart Energy Summit, February 22-24, 2016, in Austin, Texas. "Finding the right mix of incentives is a key building block in broadening adoption of energy programs," said Tom Kerber, Director, Research, Home Controls & Energy, Parks Associates. "Co-marketing agreements can dramatically expand the reach of utility marketing efforts, and several non-monetary incentives can expand program participation. 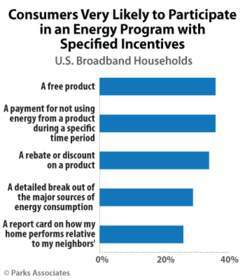 For example, 29% of U.S. broadband households are likely to participate in an energy program in exchange for a detailed breakout of the major sources of energy consumption in the home." "Information innovation is rapidly advancing opportunities for utility and consumer technologies to link up," said Denver Hinds, R&D Project Manager, SMUD. "Collaboration is essential to maximize the shared customer value of smart energy solutions." "Smart home technologies and home energy management systems offer a wide range of significant opportunities for utilities," said Claire Miziolek, Market Strategies Program Manager at Northeast Energy Efficiency Partnerships (NEEP). "These systems can provide benefits in efficiency, demand response, distributed energy resources, as well as measurement and verification, and sit poised as the tools to evolve residential efficiency programs." "To maximize the effectiveness of efficiency and other initiatives, it is important that utilities orient programs around customer value -- and to properly understand how customers perceive value. Oftentimes, the smallest emotional trigger is much more powerful than the obvious big-dollar reward," said V. Rory Jones, Co-Founder and Chief Executive, PlanetEcosystems. "Ownership of smart home devices is trending upward, but the industry needs to take an active role in order to realize the full potential of energy solutions in the consumer IoT," said Kevin Meagher, SVP Business Development, ROC-Connect. "Smart Energy Summit is the best annual event to discuss the changing demands of consumers and analyze energy strategies in the smart home." Smart Energy Summit keynote speakers include executives from EnergyHub, NRG, and Schneider Electric. Sponsors include Tendril, EnergyHub, Honeywell, Powerley and DTE Energy, Affinegy, ecobee, PlanetEcosystems, WeatherBug Home, WSI, Z-Wave, Schneider Electric, State Farm, Tyco, and WattzOn.